Make your payment here for Advanced Holography Classes. This price is per person per class. Select the number of classes and people who will be taking them below. You will be taken to a new page where a light blue bar will appear above the photo. This takes you to your cart page with payment instructions. 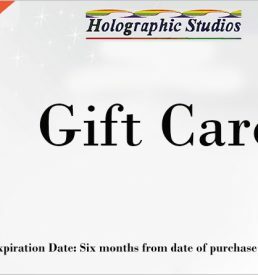 An Advanced Holography Class makes a great gift! There’s nothing to print out but you MUST contact us by email or phone to schedule the class date and time so we can confirm it. Please read the full description of the class here. Interference and Vibration – How to make and use an Interferometer, why it matters and what it does. Single Beam Transmission Holography (laser viewable) – making an On-Axis hologram. Advanced Single Beam Holography – techniques including conical and cylindrical holograms. Designing and Building a Home Holography Lab and Darkroom – learn the basics of what you need, where to put it, what to avoid, and alternatives to expensive lab equipment. Choosing the Right Home Hologrpahy Lab Equipment – to achieve your individual goals. Optics for Holography – learn how to tune a Spatial Filter, use different types of Beam Splitters, Polarizers, Wave Plates, and more. Off-axis Reflection Holography – using two separate beams to better control your hologram. Off-axis Transmission Holography (laser viewable) – this is the type of hologram you would use as a master for a second generation hologram. Image plane White Light Transmission Holography – how to use a cylindrical lens to make a “rainbow” hologram. Requires first taking Off Axis Transmission Holography Class.